Let’s take a look at three examples of awesome retail store awnings (and one restaurant for good measure). Tiffany Blue is a very specific shade of robin’s egg blue that’s been associated with Tiffany & Company since 1847. Tiffany Blue is a registered trademark, and has been used on promotional materials like boxes and bags for more than 170 years. It follows that color correctness is extremely important to the people designing Tiffany storefronts. That blue can’t be a shade too dark or too light. 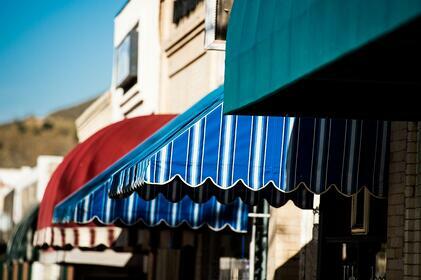 The fabric Tiffany selects for their awnings must be custom-made by the manufacturer to meet stringent brand demands. For the same reason, it’s important that Tiffany chooses textiles that last. Awning materials that aren’t properly treated for UV resistance will fade and become discolored over time. After a long and sunny summer, that Tiffany Blue starts to wash out. When color is an essential part of brand identity, faded awnings are a big problem. 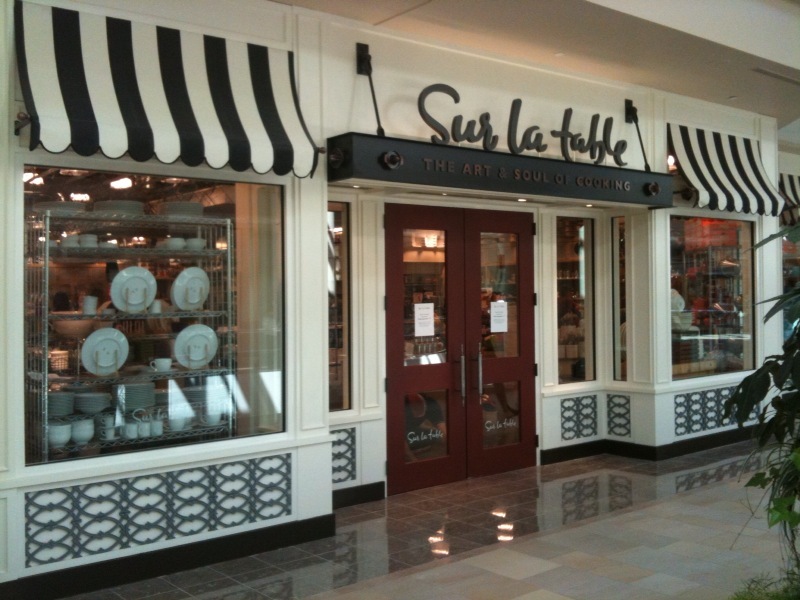 Upscale kitchen store Sur La Table has a brand that’s dripping with the elegant sophistication of a classical French restaurant. That sophistication is distilled into the Paris-inspired awnings on the exterior of this storefront. These awnings aren’t necessarily what you’d consider “understated” in the traditional sense. However, they do something very simple — they uses line, curve, and tone to create a visual effect that takes the storefront from an open-air mall in San Diego to some market district in Aix-en-Provence. In cases like this, a slight shift away from expectations can make a big difference. Imagine this storefront with just a standard plastic-looking awning on it. Creates a whole different effect, doesn’t it? However, if you use use a pvc composite textile that recreates the woven pattern of a traditional canvas awning — like Weather-Chek — you get the durability of plastic with a sophisticated finish. Another brand with iconic colorways, ULTA Beauty uses orange awnings to draw customers to their beauty supply stores. Color becomes associated with brand in ways we may not realize. A color can invoke a whole assortment of cultural associations, personal experiences, and other factors that influence how a potential buyer may feel about a brand. That’s why experts in visual branding see color psychology as a big factor in how a company presents itself. ULTA Beauty is a great example. The bright orange awnings that accent their buildings are exciting and attention-grabbing. Don’t take my word for it though, there’s research that suggests bold and bright oranges come across as friendly, confident, and cheerful. They also grab the eye, which is why hi-vis vests and construction signs use a very similar hue. 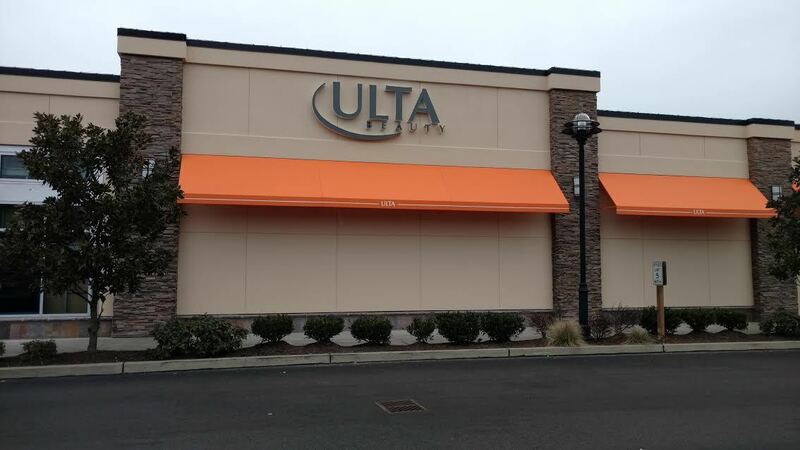 Now, it’s important that the orange in a ULTA Beauty awning stays bright and clean. When you use a bright color to draw that much attention to your storefront, you run the risk of bringing the customer’s eye to blemishes of mildew and mold on your awning — not a great look for a beauty company! High quality awnings will always be made with water-resistant textiles that are coated with anti-mildew treatments to keep them looking fresh and clean for years. 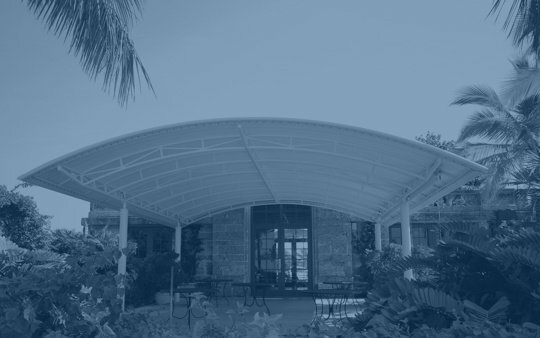 In many cases, awnings are added to buildings for utilitarian purposes as well as aesthetic reasons. More and more restaurants are looking to increase al fresco dining options during the nicer months of the year. However, most diners don’t want to eat and drink under the blaring afternoon sun in August. Awnings expand the area in which diners can be seated, enabling restaurants to add tables that generate additional revenue. As we outlined in this case study, this particular awning led to a 30% increase in summertime sales by allowing Provence to expand its outdoor seating. Utility doesn’t need to be boring, though! For Provence, Awnings Direct added a set of three squared Doric columns topped by an ocean blue awning to bring out the restaurant’s Mediterranean feel. In the image above, you can see the difference — Provence stands out among the neighboring businesses with a personality all its own. Designing the right awning for a restaurant or retail project offers architects space to be creative. Once you’ve selected the right material for the job, you have unlimited opportunity to let your client’s personality shine. See how Herculite provides a range of beautiful textured vinyl fabrics for external awnings.